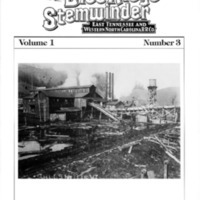 The Winter 1989 edition of The Blue Ridge Stemwinder was published by John R. Waite and features articles about Shulls Mills, the Boone Fork Lumber Company, and sawmill operation in general. Pictures are included in the articles. “The Blue Ridge Stemwinder, Volume 1 Number 3,” Digital Watauga, accessed April 25, 2019, http://digitalwatauga.org/items/show/5266.